Trackmaster Philip is based on the Pennsylvania Railroad's diesel-electric Class A6 "boxcab" switcher with an added back door and a circular back. Philip is a cheery little diesel boxcab. He works as both a station pilot and a shunting engine. Philip is painted green and yellow with the number 68 on his sides in black, surrounded by a white circle. Philip came to the Island of Sodor as the new shunting engine at Knapford. During his first day of work, he was eager to impress Gordon by showing him how fast he was, but nothing he did was enough to impress him. He challenged Gordon to a race and took off out of the yard, racing all the way to Brendam Docks. However, he seemed oblivious to the fact that Gordon had not actually competed. 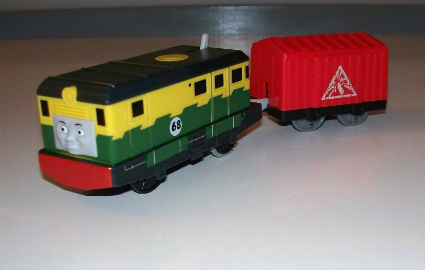 Trackmaster-PHILIP with car-battery operated motorized-NEW in Pkg Free Ship USA!